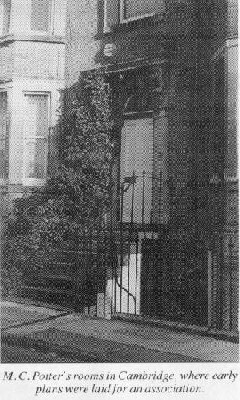 On Tuesday 12th January 1897 a meeting was held in the Church of England Young Men's Association rooms in Cambridge. Those present took the decision to re-launch the Ely Diocesan Association of Change Ringers. In this, its centenary year, the association is celebrating that event and its many achievements since. But the 'official' one hundred years is the part of the iceberg showing above the water. The origins of the association are at murkier depths. Before reaching the surface in 1897, the Ship of the Fens nearly foundered on its maiden voyage. To mark the centenary year this article traces the pre-history of the Association and the many trials and tribulations it faced before finally reaching firm, dry land. That afternoon meeting, one hundred years ago, was chaired by the Archdeacon of Ely and was considering a diocese that stretched some 120 miles west to east and over 50 miles north to south, covering all or part of the countries of Bedfordshire, Huntingdonshire, Cambridgeshire and Suffolk. Within its boundaries the incidence of change-ringing was reflected by its geography. At the periphery were the relatively high grounds - the Archdeaconries of Bedford to the west and Sudbury to the east, with the university enclave of Cambridge to the south. At the centre lay the flat fenlands with only the occasional island rising itself above, or even to, sea level. On the most substantial of these islands lay Ely itself, dominated by its cathedral but relying on the nearby church of St Mary for its ringing. Appropriately, the story begins in Ely, itself. In 1881 the bells of St Mary's became unringable. The restoration was entrusted to Messrs. Day and Son, of Eye, Suffolk. Their work was completed in time for the bells to be re-opened on Whit Monday, May 29th, 1882. Some 250 ringers, from as far afield as London and Norwich, attended this event. According to the local paper, the bells rang from six in the morning (though, officially, the ringing started at nine). So soon as the trains arrived, our streets were thronged with campanologian, playing upon handbells... 150 sat down to luncheon and 400 to tea. It was at the luncheon in the Boys' room of the National School that the proposal for a diocesan association was first mooted. Gervas Holmes Esq., J.P., M.A. (Moore, Holmes and Mackenzie) introduced the idea in a speech; which was very warmly received; and it was resolved by several ringers that steps should be taken at once to carry out the suggestion. Holmes was well-known in the area. He had been a member of the band at Great St Mary's, Cambridge while an undergraduate at Emmanuel College in the 1850s. Subsequently he had started a bellfoundry at Harleston, Norfolk, in conjunction with Captain A. P. Moore and Mr. H. A. O. Mackenzie. His proposal fell on receptive ears. Holmes was respected figure. The national mood was for organisation, scientific ringing and belfry reform. Many areas had already formed Guilds and Associations and others were anxious to follow suit.. The Bell News and Ringers' Record greeted with enthusiasm the proposal for an Ely Diocesan Association... we shall be pleased to hear of its quick realisation. As we have previously maintained, Diocesan and county Associations, in which many of the clergy find it very agreeable and pleasant to become members, are an immense factor in the extension of the true principles of sound ringing. Then by all means let there be a Diocesan Association for Ely immediately. No one can foresee the extent of the ultimate good which the establishment of such a body must have upon the prospects and reputation of bell-ringing in the diocese, and we confidently hope, nay we implore the clergy and all the wealthy churchmen to lend their aid in the promotion of such an inestimable undertaking. Worthy sentiments, but the formation of the association was not to be quite immediate, nor indeed were clergy and churchmen, generally, to prove so enthusiastic. Following the luncheon the Reverend Kenelm H. Smith of Ely agreed to undertaken some preliminary organisation. These soundings bore fruit in December 1882 when a letter was circulated generally through the diocese, canvassing support for the idea. The response were clearly favourable and the omens looked good. The Bishop afforded his patronage and the idea received an imprimatur from the Diocesan Conference. 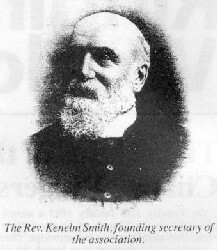 A provisional committee was formed with Kenelm Smith acting as honorary secretary. It was chaired by the Archdeacon of Ely and numbered six clergymen and three laymen. There was a strong Cambridge influence in the committee. It included the vicar of Great St Mary's, and five ringers - both lay and clergy - with strong University connections. Among these were Mr M C Potter of Peterhouse, who had been a founding member of the University Guild three years earlier and the Rev. A.H.F. Boughey who was to be its president for 57 years. This committee met on Sundays through the spring of 1883, in the rooms of Mr Potter at 10 Brookside, Cambridge. By summer the committee was ready to act. On Bank Holiday Monday 6th August, a ringing meeting was held in Cambridge for the purpose of establishing a Diocesan Society in support of change ringing. Apparently, despite all the planning, the meeting was held at short notice. This led to a smaller attendance than hoped for, but ringers came from Bury St Edmunds, the Swaffhams, Ely, Fen Ditton, Cherry Hinton, Woburn and Cambridge. They rang at St Benedict's and Great St Mary's before attending a short service at the latter. 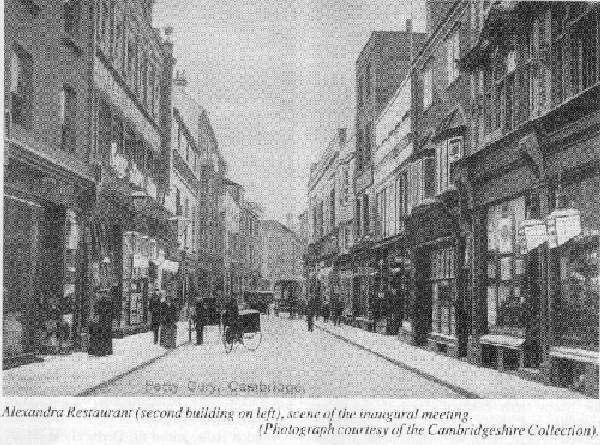 As the Cambridge Chronicle reported, An adjournment was then made to the Alexandra Restaurant, Petty-curry, where the company sat down to a cold collation... After dinner a meeting was held, the Rev. the Vicar of St Mary the Great being in the chair... It was then proposed by Mr ELLIS (Ely), and seconded by Mr OSBORNE (Bury), 'That a Diocesan Association of Ringers be formed'. This was carried unanimously. Kenelm Smith was confirmed as Honorary Secretary. Mr M.C. Potter became the Treasurer. Some few months since the Bedfordshire Association was inaugurated - we being in the diocese - when Dr. Woodford, the Bishop of Ely, courteously became the patron - the Archdeacon of Bedford being the president. The question was mooted as to the propriety of making the society a diocesan one, but the followers of Change-Ringing in Bedfordshire being very limited, and there being many accomplished companies of ringers in other parts of the diocese, it was deemed best, from a practical point of view, that we should proceed with the formation of our county society, thus avoiding any egotistical display on our part. It would be interesting to know why the Bedfordshire ringers were so anxious to go ahead with the formation of their own association at just this tie. They were very well aware of the wider diocesan proposals, as Mr. Herbert was a member of the provisional committee that met in Cambridge though the spring! Perhaps, though, Bedfordshire felt less affinity with Ely than some other areas, having been transferred to that diocese only in 1837 when the See of Lincoln was felt to be too large and unwieldy to manage. The inaugural meeting of the new Association was held at Ely on Saturday 20th October 1883 and attracted a fair attendance, including members of the Bedfordshire Association. After ringing, the business meeting agreed that the Bishop should be asked to become patron. Arrangements were made to appoint a committee. A subscription of one shilling per annum was agreed on for ordinary ringing members. The annual meeting was to be held in Cambridge. If possible, quarterly association meetings were to be held and thrice yearly district meetings at Bury, Wisbech, March, Huntingdon, Sudbury, St Ives, Ely, Bedford and Cambridge. Several batches of members from Glemsford, Bury and other places were elected by acclamation. These, perhaps overly ambitious, plans were to bear a poor fruit. Promise and enthusiasm rapidly waned. Kenelm Smith's entries in the first minute book reveal a depressing picture. Easter Monday 1884 - a small attendance for the district meeting on the recently restored bells at Bury St Edmunds. Easter Monday 1885, meeting at Ely - but very few members attended tho' business was transacted. Some good ringing was done and members were elected, but in 1887... owing to the absence of the Treasurer from Cambridge; his not having put the Accounts in the Secretary's hands, and having omitted to carry out the order for printing the Report, as ordered; no annual Meeting, according to Order. was held. A sorry state of affairs that Kenelm Smith, try as he might, seemed powerless to reverse. Unfortunately, like many association secretaries, too often he found himself preaching only to the converted. At the April 1886 meeting The Secretary addressed a few plain and pointed remarks respecting the supineship and apathy which he found existed amongst Ringers - respecting the advantages to the Craft and Exercise, resulting from Membership... and strongly exhorted all Ringers to try and impress their Brethren with the Desirability of at once joining the Association. This time the words fell upon deaf ears. By 1888 the Association was in such a parlous state that even visitors to the area were moved to comment on it. A meeting in Cambridge was attended by Mr. Spittle of Dudley, Master of the Worcestershire Association. Showing none of the reticence we might expect today, he addressed some pointed, plain and practical Remarks to the Company, expressing his surprise at the apathy and want of Interest displayed in this District. An editorial in the Bell News in August went even further. "It certainly cannot be maintained that the majority of ringers in the Ely dioceses possess any remarkable aptitude for great exertion, so far as the exercise of ringing is concerned. Neither do we find among them any sign of a movement which is calculated to give encouragement to the Honorary Secretary in his work - a work, by the way, he has manfully adhered to through good and evil report. Are the ringers of the countries concerned affected by any peculiarity of the soil therein? This part of East Anglia is believed to be of a flat, marshy and somewhat stagnant nature; if this is true, has it a corresponding effect on the people who inhabit it? The suggestion would seem reasonable so far as ringers are concerned. Among the ringing Associations the one we are dealing with seems to be the most backward in every respect." This salvo produced an angry reply from the Bedfordshire Association, drawing a distinction between the satisfactory situation in that county and the state of affairs in Huntingdon and Cambridgeshire. It identified the difficulties of travel across such a large diocese as a major factor militating against the success of a single organisation, and suggested that the best solution would be an association for each Archdeaconry, with a joint annual meeting. It was probably true that geographical factors played a large part in the association's difficulty, as there was clearly no shortage of enthusiasm for ringing in much of the diocese. In the same year, the Essex Association was able to report at its AGM that it had acquired various non-resident members including strong contingents from Long Melford and Glemsford (both in the Sudbury Archdeaconry)... an accession of experienced ringers whose names have quickly found their way into the peal books. For Kenelm Smith a meeting on Whit Monday 18th June 1889, at Soham seems to have been the final straw. It was wet. There were only three ringers from Cambridge, none from Mildenhall or Newmarket, and only a few from Ely. Touches of Bob Minor and one of Bob Major were rung. Discussion focused on the difficulty of competing with other Bank Holiday attractions. The Secretary was moved, once again, to make the state of the Association more widely known. His report on the meeting for the Bell News ending. This Association still struggles on, but owing to the geographical difficulties of the diocese, the utter apathy to ringing displayed by the clergy, and the callous indifference of the ringers, makes slow progress. The calls for smaller, Archidiaconal-based district associations were beginning to gain ground. The Suffolk ringers took the idea on board and began to promote the idea at the Long Melford meeting in September. However, when it came, the immediate catalyst for change was a relative newcomer to the Ely area, the Reverend J.R. Vincent, later Dean of Bloemfontein. He had been a student at the Ely Theological College before moving to Oxford and becoming a member of the Oxford Guild. He returned to the Ely college in 1890, as chaplain and lecturer, and was appalled at the state of the ringing society. Bringing his experience of the organisation in Oxford, he had several meetings with Kenelm Smith to discuss the steps that could be taken to resuscitate and quicken the dry bones. They agreed that a meeting should be called for 8th December 1890, in the parish rooms at St Mary's, Ely, at which Mr Vincent would propound his ideas. He duly suggested that, for a time, the focus of the association should be narrowed. In a smaller geographical area he hoped that development could take place on a firmer basis. There was a successful archidiaconal association in Bedford, why not at Ely? After much discussion the proposal was carried unanimously: That a District Association for Ely and the surroundings parts be formed (within the original Diocesan Association). Ranulph Vincent was elected as secretary, an office that he held until June 1892. Arthur Pilgrim of Ely became Master of the District Association. For the time being the Diocesan Association fell into a state of suspended animation, though Kenelm Smith continued as its honorary secretary and treasurer, overseeing a bank balance of £4-18s-10d. The change to a District Association began to pay dividends. At its inception it consisted of only five companies - Ely, Newmarket, Stretham, Soham and Wilburton. 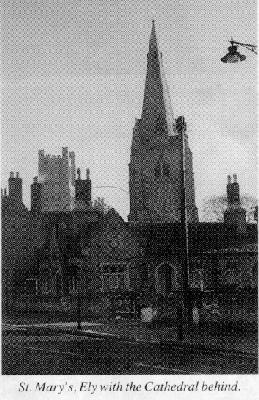 By 1894 the annual report showed that 14 towers were affiliated, all within 20 miles of Ely, and with a total of 83 ringers between them. It had held quarterly meetings at Huntingdon, Wilburton, Ely and Newmarket. Nevertheless, it still had to contend with a lack of enthusiasm from some towers. The account book of the Sawston ringers included this entry for December 1892, "... Sub to Ely District Assn ... 5s 0d (N.B. 12/- was due, but sent this, as we do not intend to continue to be members)." Overall, though, by 1895 the Ely District Association was succeeding too well. It had spread its web widely and had again become too unwieldy for its own good. It had in fact established itself as the diocesan association by any other name. It was agreed to divide it further into Archidiaconal Districts, each having its own separate organisation and holding its own local meetings. Ringing in the Suffolk part of the diocese had always been relatively strong and so the first meeting of the newly formed Sudbury Branch was held at Lavenham on 15th July 1895, with Charles Sillitoe of Sudbury elected as District Secretary. By 1896 the District Association numbered 21 honorary and 185 ringing members, belonging to 36 different companies across the diocese (not including Bedfordshire). A number of peals had been rung during 1895 and 1896, all bar one by the Sudbury branch. It was this measure of success that turned thoughts to a revival of the Diocesan Association. You are requested to urge all members to be present if possible; and to let us know not later than January 4th, how many will be coming, and the station from which they will travel, in order that we may arrange for cheap tickets (single fare and a quarter), to be issued, on production of members' cards. After ringing Plain Bob and Stedman at four Cambridge towers, 51 people attended the meeting. Between them they represented some 20 towers. After a substantial meat tea the meeting heard a brief history of events, before voting unanimously that the associations be amalgamated and once again operate under the 'Diocesan Association' banner. Walter Crump was elected as General Secretary, with Kenelm Smith as his Treasurer. The spirit of union was abroad. However, it had not quite completed its task. There was still the question of the Bedfordshire ringers. They had not been represented at the Cambridge meeting. Should they or should they not become part of the wider diocesan association? At the first meeting of the new association on August Bank Holiday, the general secretary reported that negotiations were in hand to arrange a scheme of mutual co-operation with the Bedfordshire Association. An affiliation proposal was to be put to both associations at their annual general meetings which, by chance, fell on the same day. On Easter Monday 1898 the Ely AGM was held at Bury St Edmunds. The proposal that the Bedfordshire Association become the Bedford Archidiaconal Branch of the Ely Diocesan Association was carried. The Bedfordshire Association AGM was held at Bedford. Despite support for the idea from the Bedfordshire secretary, The Rev. W.W.C. Baker, the affiliation proposal was rejected by a large majority. One of the major factors swaying the vote was a concern that the peals rung in Bedfordshire would be 'lost' I a general total for the whole diocese! Mr Baker expressed his disappointment in no uncertain terms. In replying to the discussion he said that he was often disheartened to see that however much bellringing prospered it did not appear to materially improve the performers' churchmanship. Many of the remarks that had been made would almost lead one to infer that some of the laments that pervaded such sports as football had begun to find their way even to the art of bellringing. The following week, the Plain Speaker column in the Bell News continued in a similar vein but a rather different tone. The officers of the Ely Diocesan Association kept a dignified silence, at least in public. And that was that. Despite the disappointment felt on all sides, no further proposals for affiliation or amalgamation were put forward, until the problem was solved in 1914 by yet another transfer of the Archdeaconry of Bedford, this time to the Diocese of St Albans. That transfer re-defined the western border of the diocese and the Ely Diocesan Association as it is today. It was not until just after the First World War that the eastern border was similarly defined, with the formation of the Suffolk Guild and the consequent loss of the towers in the Sudbury Archdeaconry. However, just as concentrating on a smaller geographical area had allowed the Ely District Association to prosper and expand, the smaller size of the diocese after 1922 allowed the Ely Diocesan Association to focus its activities and breed its own successes... but that is another story.